brief look at some key industry clusters. • The bio/pharma life sciences cluster accounted for $23 billion (nearly 5.0%) of New Jersey’s Gross Domestic Product in 2009. • New Jersey’s bio/pharma life sciences employment totaled 125,965 in 2009, or 4.0 percent of the state’s private sector workforce. Nationally, the proportion is just 2.0 percent. 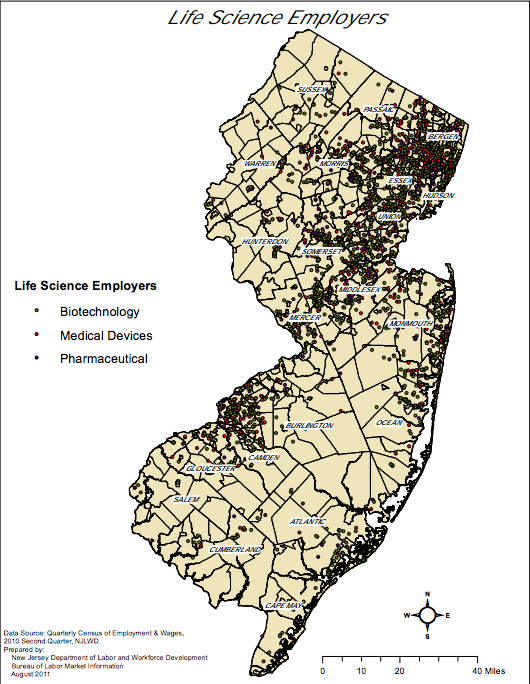 • New Jersey’s bio/pharmaceutical and life sciences cluster employment is comprised of three primary components: pharmaceutical sector (44.2%), biotechnology (34.1%) and medical device manufacturing (21.6%). • Over the past five years, this cluster’s establishments have expanded by 15.9 percent in New Jersey, outpacing the nation by 6.0 percentage points. • New Jersey bio/pharma life science employers paid more than $14 billion in wages during 2009, or 8.1 percent of the state’s total wages. • New Jersey’s highly educated workforce is profoundly seen in this cluster as nearly two thirds of its workers hold at least a Bachelor’s (33.1%), Master’s/Professional (23.0%), or Doctoral (8.2%) degree. • In 2009, transportation, logistics and distribution (TLD) employed 364,429 workers in New Jersey. The cluster employed 11.9 percent of the state’s private sector workers, a higher percentage than for the nation (8.9%). • TLD contributed 48.6 billion dollars to the state’s Gross Domestic Product (GDP) in 2009. • In 2009, employers in the state’s TLD industry cluster paid a total of $22.9 billion in wages. • The dense population (1,195 persons per square mile) and higher income level ($50,221 2009 median household income) of New Jersey and the region surrounding it make the Garden State a prime location from which to distribute goods to consumer outlets. • Located between New York City and Philadelphia, New Jersey is within a day’s drive of 40 percent of the US population who purchase $2 trillion in merchandise yearly. • The state offers access to the nation’s freight rail network and the state’s commuter rail network and is also home to several key transportation facilities necessary for a strong TLD industry cluster including three major seaports and a large international airport. • Despite a relatively small employment base (5.2% of total employment in 2010) finance and insurance contributed $39.4 bil- lion or 8.4 percent to the state’s Gross Domestic Product in 2009. 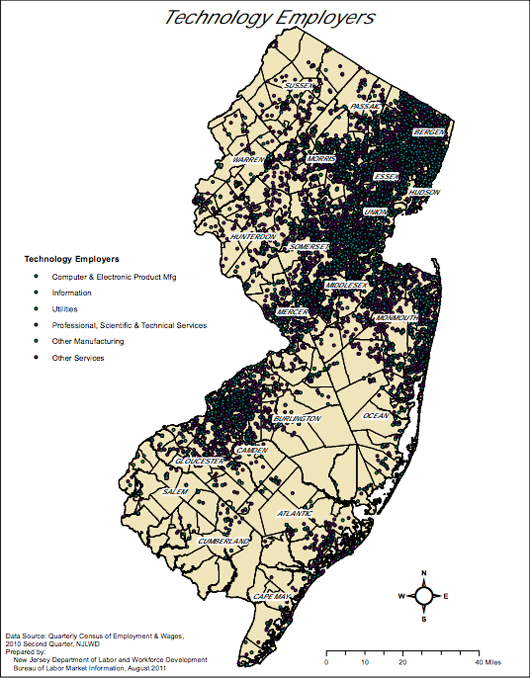 • Twenty-two of New Jersey’s top 25 financial services employers are located within 40 miles of Manhattan. The state’s compet- itive real estate rates, lower corporate tax rates, lower utility costs and highly educated talent pool make it a desirable location. • Financial services relies heavily on information and technology. New Jersey has remained in the forefront of technological advancement by becoming a national leader in developing data centers to support the industry. 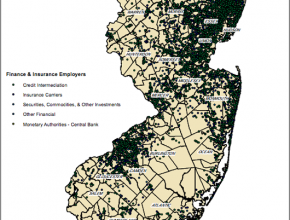 • New Jersey’s financial services sector lost 7.9 percent of its employment base from 2007 to 2010; there were approximately 199,000 finance and insurance jobs in the state in 2010. However, finance and insurance saw a 16.9 percent rise in jobholding from 1990 to 2007, adding approximately 31,200 jobs. • In 2009, almost $18.5 billion in total wages was paid by New Jersey’s employers in financial services industries. • The advanced manufacturing industry contributed over $17 billion to New Jersey’s Gross Domestic Product in 2009, or about 3.6 percent of all state output. • In 2009, there were more than 127,000 people employed in industries classified as advanced manufacturing in New Jersey. This represents about 48 percent of all manufacturing employ- ment in New Jersey. • Chemical manufacturing employed over 57,000 in 2009, 21.0 percent of all manufacturing workers in the state. New Jersey also hosts over seven percent of all chemical manufacturing employment in the United States. • The state’s advanced manufacturing industry establishments paid a total of more than $11.6 billion in wages in 2009, or roughly 6.8 percent of New Jersey’s total wages. 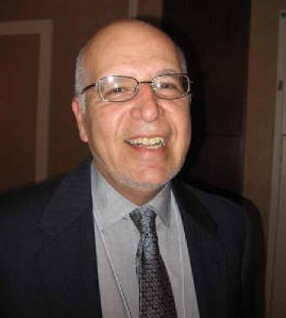 • The health care industry contributed $34 billion to New Jersey’s Gross Domestic Product (GDP) in 2009, or roughly 7 percent of all state output. • Health care industry employment is found in three industry groups: ambulatory health care services (44%), hospitals (36%) and nursing and residential care facilities (20%). • From 1990 through 2010, the health care sector in New Jersey has added 154,800 new jobs, while all other industries combined had a net gain of only 54,600. • Health care is the only industry that has added jobs in the state every year from 1990 through 2010 while increasing its share of jobholding from 7.5 percent in 1990 to 11.3 percent in 2010. 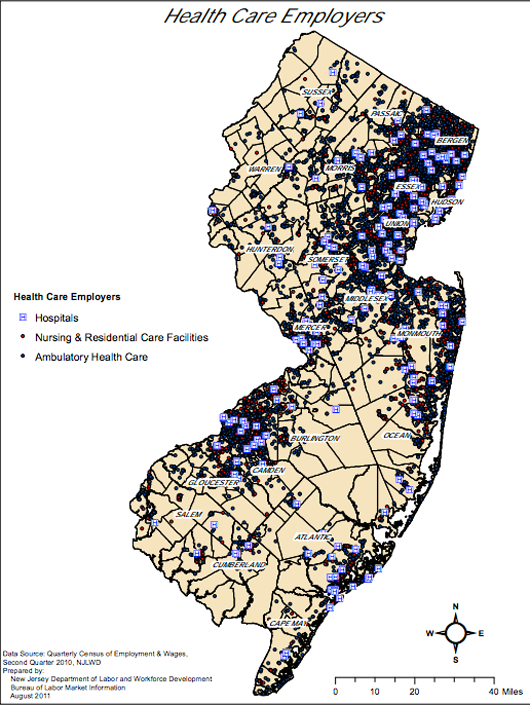 • The outlook for New Jersey’s health care employment is bright. From 2008 through 2018, it is projected that more than 56,000 jobs will be added, an annual increase of 1.3 percent. • Health care establishment employers paid more than $21 billion in total wages in 2009, or about 12.2 percent of all wages paid in New Jersey. • Leisure, hospitality and retail (LHR) is comprised of four components: retail trade (56.0% of employment), food services/drink- ing places (29.0%), accommodation (8.0%) and arts/entertainment/recreation (7.0%). • Many of the businesses within LHR directly and indirectly support the state’s tourism industry, the state’s 3rd largest industry according to Division of Travel and Tourism. • LHR represented $41.7 billion or 8.8 percent of the state’s Gross Domestic Product in 2009. • LHR jobholding totaled 766,410 in 2009, or 24 percent of the state’s private sector workforce. • Over the past two decades, LHR added nearly 62,000 new jobs in New Jersey or about 28 percent of the state’s employment gain since 1990. However, its share of total employment increased only slightly during this period, from 19.5 percent in 1990 to 20.0 percent in 2010. • Green describes many of the innovations, industry changes and investments designed to develop an economy and infrastruc- ture that employs more efficient, cleaner, sustainable, environmentally friendly and homegrown energy sources. • In New Jersey in 2009, the Green economy employed 200,521 workers in three major areas: green energy production/re- newable energy (24.5% of employment), energy efficiency – green building/construction/design (68.0%) and environmental remediation/waste management reduction (7.5%). • In 2009, nearly $15.5 billion in total wages were paid by employers in New Jersey’s Green economy cluster. • New Jersey has been called the number-one state for renewable energy incentives. • The Garden State’s highly regarded Solar Renewable Energy Certificate (SREC) program lets home and business owners sell clean energy credits to utility companies. • The federal government recently announced four priority areas for wind projects off the Eastern Seaboard that are being fast-tracked for environmental reviews, one of which is a 550- square mile section off the coast of New Jersey, from Avalon to Barnegat Bay.